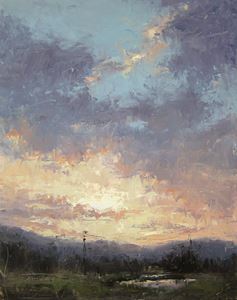 And the winner is: Jane Hunt's #11, Autumn Sunset. Congratulations, Jane. #11 Autumn Sunset, 14x11, oil, Location: North Boulder Pond. Hover over the images to see the captions. Click on any image to enlarge. You will be able to traverse back and forth among the images. 4 - My Kind a Place, 12x16 oil, Port Angeles, Wa. 10 - Rio Grande Valley Below Sandias, 8" x 12", Oil on Linen, Location: West Bluff, Albuquerque. oil on MDF panel 13"x 16.75"